LuxBet is an established bookmaker in the Australian betting landscape, having been around since 2008. It’s actually Tabcorp’s corporate baby and allows the company to offer a broader range of odds and sports than it would with tab.com.au and on the tote. The good thing about LuxBet being backed by the TAB is it gives you the peace of mind that you can bet with confidence and security. Based in the Northern Territory and licensed by the Northern Territory Racing Commission, LuxBet can offer markets, like novelties and non sporting related events that the TAB cannot, helping Tabcorp broaden its reach. And the good thing is that, despite being a corporate bookmaker, LuxBet’s taxes, just like the TAB’s, go back into the racing industry. As you can see from the list, if you’re trying to find a market to place a bet on, the chances are LuxBet will have it covered. It’s LuxDiv and Best of the Best betting returns put it at the top of the corporate bookmaking chart for racing, giving punters the best returns possible. As far as its take goes, LuxBet’s vig is 4.8 per cent. We reckon anything below 5 per cent is good going for the bookie’s juice. Luxbet is fully functional on all desktop computers, smartphones & tablets with the latter two boasting market apps available to its Aussie customers. Visit Luxbet.com and you will see a variety of banners and bonus offers enticing you to sign up at this bookie. At the top of the website, there is entry slots for username and password and it’s as simple as inputting those two pieces of information correctly and hitting log in or enter to access your account. Right next to the log in menu across the top is a help menu that leads you to the customer service menu and frequently asked questions. The bet slip sits on the right hand side, above LuxBet’s specials, quick bet, blog, Lux Div and Quick Multi menus. It used to have the typical ‘sports down the left hand side’ set up of many of the other corporate book makers’ websites, but, in 2013, it made the change to a menu across the top. The main screen is taken up by a pretty nifty navigation panel with all the sports and racing you can handle and below that is a promo for weekly specials and offers, bonuses and other big events for punters. With the company’s focus on racing, it’s no surprise it takes prominence on the site. The first betting options you’ll find once you log in are on the next three races to jump. You can tailor this to your interests, like harness and greyhounds, but it defaults to the thoroughbred racing and shows the first nine runners in the race. You can bet from there or explore more bet options on the race. Below that, it gets into the sport, with a menu showing the next three events to go. Below that there is then a featured sport betting. When we visited most recently, it provided the head to head odds for each match of the current NRL round. Probably our favourite feature is the ‘Quick Bet’ option. Instead of adding your betting options to the bet slip, as you would with most corporates, you can place your bets in the one place – as it suggests, this is the quickest way to bet on the internet. And the best thing is, if you like it, turn it on, if you don’t like it, you can easily turn it off and go back to the traditional bet slip option. At the bottom of the site, there are menus for the services the company provides, betting information on its sports and racing options, and information on contacting the company. The Best of the Best option on Saturday metro races pays either the top flux or the best of the three totes, whichever pays the most. LuxDiv is available on all Australian gallops and this pays either the official starting price or the best of the three totes as well. With the racing, you can also have your own selections out of top fluc, choose your state’s tote and LuxMid. You’ll find a variety of markets on the big Aussie sports like AFL, NRL and cricket, as well as America’s best, NFL, NBL, NHL and MLB and the best Euro sports, obviously with a particular focus on soccer. Of course, LuxBet’s purpose was to provide novelty and non sport betting, so you’ll find plenty of competitive odds on things like elections. They also have a funky program call ClubXtra, which provides owners and trainers with a 12 per cent bonus on any bets on horses that they own or train. Pretty cool. You only need $1 to lay a bet with LuxBet. Obviously, that’s not going to go a long way, unless you can some how put together a monster parlay at huge odds, but that’s comforting for those people who like to bet that way. As far as maximum bets, LuxBet operates on the size of the pay out. Whether it’s a single or a multi, the absolute maximum LuxBet will pay out is $150,000. This figure is the peak pay out, but for some markets this is reduced. Multis are limited to 1500 times the bettor’s stake and if you want a multi on the horses, that is limited to 10,000 times your wager. While it doesn’t quite have the deposit and withdrawal options of many of the other corporate bookmakers, LuxBet has just enough possibilities to keep punters satisfied – as long as you can get your money in, you can then enjoy all those racing and sports betting benefits. LuxBet sticks to the more traditional methods of deposit, like credit cards, bank transfers and BPay and also has the benefits of POLi and Skrill. So there are enough options there. Many of those options are instant, meaning as soon as the transaction is done, the funds are available for you to bet with. Just remember, your bank transfer or BPay can take up to 48 hours to go through, so don’t try and make the transaction moments before your race starts. Make sure you plan ahead if you’re going to use this method. Withdrawals also get sent by bank transfer, straight to your account, which you will need to get verified. As with the deposit, the withdrawal also takes time to come through, while the banks dilly dally. As we’ve mentioned, LuxBet is backed by Tabcorp, so you know it will be sticking to the most strict Australian regulations for security. It’s website is certified PCI DSS compliant by Vectra Corporation, making personal details – and your funds – completely secure. 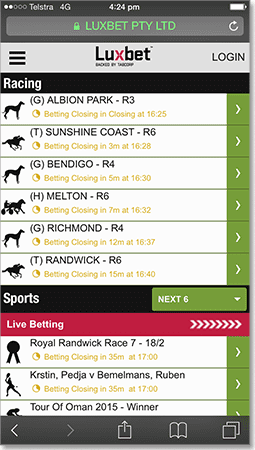 Like all the big bookmakers in Australia, LuxBet has developed a handy and very functional app for both smart phones and tablets, along with a mobile website, should you not wish to download the app. Use your browser to access the mobile website from your Apple or Android enabled device or download the app. The LuxBet app is very simple, but that’s perfect for users on the go, who just want to place their bets with simplicity. You get your events, both racing, sports and others, listed in the order of when they are going to start, with obviously the most recent at the top, and it’s very easy to find what you want to bet on. You can access a racing form through the app, which is very handy if you’re undecided on your bets and need some inspiration and you the one place. You can also lock away your app with a pin number that provides access when entered, should you wish. To download the correct app for your device you can use the links at the top of this page, or visit the mobile website. Punters have reported LuxBet’s performance in this field as a negative, but we have recently heard that there has been some improvement on that front. There are the usual phone lines for racing and sports to get your bets on, as well as customer support. Live Chat – Available Monday to Saturdays, 8am to 10pm and Sunday until 6pm. You know we love racing at cupsbetting.com and, with the amazing array of little bonuses and betting options available at LuxBet, there’s no way we can resist. While we’re not overly happy with the banking options, with many other bookies providing a host of deposit and transfer options, the racing betting is just off the chart. We want the best odds. LuxBet has them. We want plenty of betting options. LuxBet has them. We want a bit of sport to go along with our racing. Yep, you guessed it, LuxBet has that in spades. You know that it’s backed by Tabcorp and that gives you plenty of comfort. The TAB has always looked after punters and has a reputation to uphold. So sign up, nab your $500 matched deposit and enjoy the features.